If you are interested in joining the Army, the process that you have to go through is rigorous as the Army want to ensure that you are joining something for life and not going to feel that it is the wrong decision down the line. Working in the Army means that you need to be very dedicated to serve the Country and it will require both mental and physical strength and stamina. You will be going through interviews, meetings and tests through this process so ensure that your first piece of communication with the army is well tailored to show your skills and where you want to be in your career. There are many careers in Army to choose from. Check out Army’s careers website to learn more about applying for a job. If you are looking for help in writing a cover letter, please see the below example that you can use as a guide. 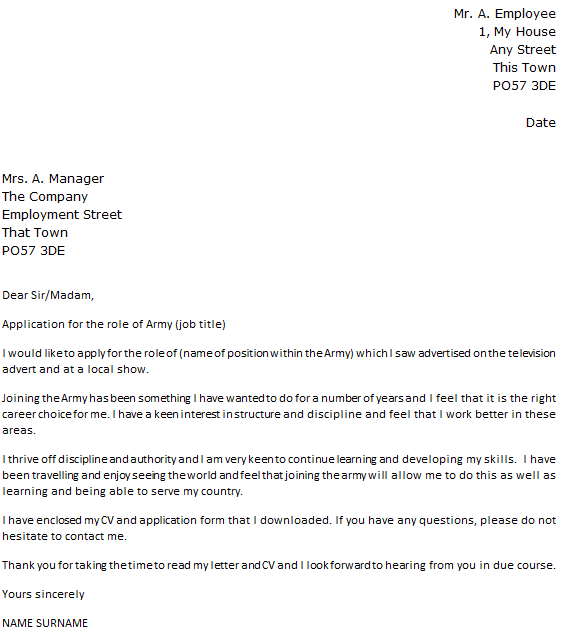 These example letters may not be sent to the Army directly however you can use it during your job application process. Make sure that you have amended this letter as suitable before using it for yourself. I would like to apply for the role of (name of position within the Army) which I saw advertised on the television advert and at a local show. Joining the Army has been something I have wanted to do for a number of years and I feel that it is the right career choice for me. I have a keen interest in structure and discipline and feel that I work better in these areas. I thrive off discipline and authority and I am very keen to continue learning and developing my skills. I have been travelling and enjoy seeing the world and feel that joining the army will allow me to do this as well as learning and being able to serve my country. I have enclosed my CV and application form that I downloaded. If you have any questions, please do not hesitate to contact me. Thank you for taking the time to read my letter and CV and I look forward to hearing from you in due course.